Is a Tub to Shower Conversion a Good Idea? When remodeling their bathrooms, many homeowners desire spacious walk-in showers. In many homes, the only way to make this possible is by removing an existing bathtub. What happens, though, when doing so means getting rid of your only tub? Is a tub to shower conversion really a good idea if it means no longer having a bathtub in your home? Generally speaking, if you won’t miss having a tub, go for it! If you only on selling your home, though, the lack of a bathtub could deter some buyers. Before you make a final decision, here are a few things to consider. Since large walk-in showers are popular features, having one already installed could entice some buyers to make an offer. For others, though, the lack of a tub may be problematic. Many adults find themselves too busy to take baths, so sacrificing a bathtub isn’t a huge issue. Couples with young children, however, may see the lack of a bathtub as a deal-breaker. If you live in an area that is appealing to young couples, you may want to reconsider replacing your only tub with a walk-in shower. Even pet owners may consider a bathtub a must-have. If your home is located in an area that is mostly popular among retirees and single people, though, getting rid of your bathtub may not have as much impact when trying to sell your home. If you’re thinking about investing in a tub to shower conversion project, schedule a consultation with a licensed plumber, such as G.T. Campbell. If you plan on selling your home in the next few years, it may even be a good idea to meet with a real estate agent in your area to discuss what – if any – impact the remodel will have on your home’s resale value and appeal to homebuyers in your area. At G.T. Campbell, our licensed plumbers can help you determine the best way to add a spacious walk-in shower to your home. Whether we replace an existing bathtub or you have enough space to install the shower in another location, we will help you turn your vision of your dream shower into a reality. We’ll also be mindful of your budget and work closely with you to provide you with the bathroom you want at a price you can afford. If you’re ready to take the plunge and update your bathroom, contact us today to schedule a consultation. 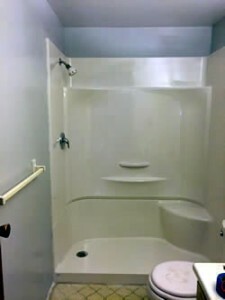 For tub to shower conversion in Rochester and the surrounding areas, please call 585-412-4008.